Apart from meeting a geisha, meeting a ‘samurai‘, wearing a kimono, watching a sumo match, and trying a Japanese onsen, another one of my top goals when I was in Japan was to try a teppanyaki restaurant that serves high-grade wagyu (Japanese cattle) and REAL Kobe beef! As some of you may know, these types of Japanese beef are expensive — BUT! I’m willing to pay the price since it’s an absolutely unique and worthy experience that I’ve been dying to try, especially in the country that it has originated from. Teppanyaki is a special cooking style in Japanese cuisine that uses an iron griddle to cook food that can range from meat, seafood to vegetables. (Teppan means iron plate in English, and yaki means broiled, grilled, or pan-fried.) Typically as well, teppanyaki chefs would cook in front of their guests — sometimes, even with a special show as they juggle their utensils, flip eggs in the air, etc. (but this performance is more commonly done in the United States and NOT in Japan). Regarding the meat though, you might be wondering why I put emphasis on the world “real” for the Kobe beef part. Well this is because the export and use of authentic and trademarked Kobe beef from Japan is highly restricted. In fact, it was only in 2012 that they started to export the meat (it was to Macau) and today, though it has expanded to other places like the United States, Europe, Canada, Singapore, Philippines, and more, the list of restaurants that serve genuine Kobe beef are still NOT that many. What exactly is Kobe beef? And why is it expensive? These Tajima-gyu cows which are also called as “motoushi” or purebred seedstock cattle have maintained a pure bloodline since the Edo period (1615 to 1867) which also means that its delicious taste has been protected — hence, this is one of the reasons why it is expensive. Other factors that contribute to the Kobe beef’s high price tag is its scarcity and the high-quality feed that is being fed to the cows. TRIVIA: “Wagyu” means ‘Japanese Cattle’ so it is a generic term that refers to ALL of Japan’s cattle breeds. It is further divided into 4 breeds: Japanese Black, Japanese Brown, Japanese Poll, and Japanese Shorthorn. Tajima-gyu from which Kobe beef comes from is classified under Japanese Black breed. Meanwhile, if you’ve heard of the term kokusan-gyu, this refers to all cows that are raised within Japan, in which it has spent more than half of its life there. How then can I know that I’m eating real Kobe beef? 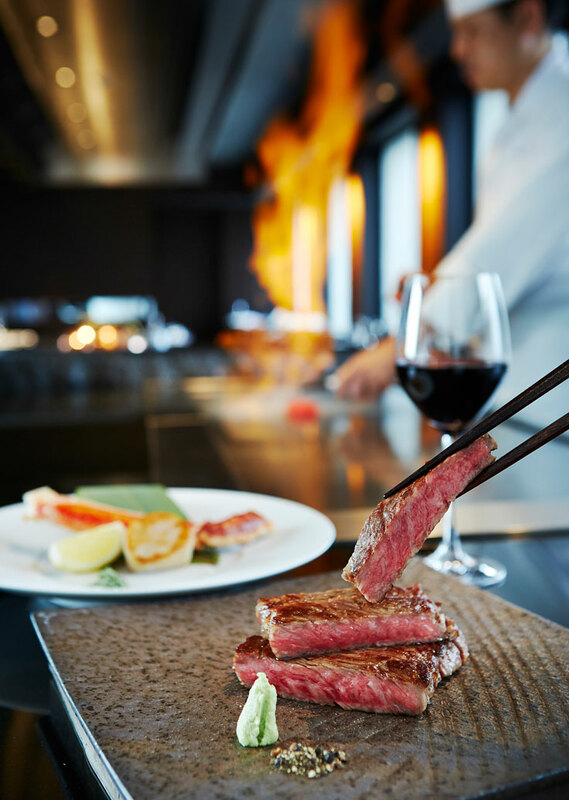 First and foremost, if you’re planning to dine at a restaurant, you can check by the official list on the Kobe Beef Distribution & Promotion Council to check which are the authorized establishments that have been granted the right to serve it. Another good indicator is the price wherein an ounce should cost around $55 (or Php 2,500+). So if you’re ordering a burger that’s said to have Kobe beef on it and it costs only around $10, then you should be wary since they’re just evidently slapping the term ‘Kobe’ on a Japanese kind of beef that they got their hands on. Meanwhile, if you’re planning to buy retail or wholesale, the website also shows the authorized distributors. Once you’re there, feel free to ask for a proof of certification as well to ensure that you’ve got your money’s worth. Is it true that for Kobe beef cows’ rearing methods, they are made to listen to music, are being given beer, and massaged? There may well be some farms rearing low numbers of cattle who are doing things bordering on this. But, this does not mean that these rearing methods are all standards for producing prime Kobe Beef. For example, if you make it a custom of playing music at feeding time, then the cows as a conditioned reflex know that it’s feeding time just by hearing the music, and this, it is said, increases their appetite. However, the affect of music improving meat quality has not yet been proved. There is also the theory that beer is useful in improving cows’ appetites. Actually, however, it can be said that there have been almost no cases of cows being raised on beer. And, massage, too, is considered to be useful in lowering cows’ stress because of the close, physical contact it provides and in indirectly helping to improve the quality of the meat. Once again, however, massage itself neither softens meat nor increases the amount of marbling. Now let’s move on to my actual mouth-watering affair at a teppanyaki restaurant! First and foremost: I know that I could have just gone to any Japanese steakhouse to get my dose of wagyu beef; however, I wanted to undergo the experience of such a special cooking style. Besides, it is said that a high-quality teppan and skilled chef can make a HUGE difference to the flavor of a steak — so, if you combine those features with an ever-so-tasty Japanese beef then I was sure I’ll be in for a treat. And boy… I really was! Thanks to Keio Plaza Hotel Tokyo, I was able to try teppanyaki at their Yamanami teppanyaki restaurant which was duly accredited on the Kobe Beef Distribution & Promotion Council’s list. They offer selections from their à la carte but you can also opt for a set menu. Since I was in Japan during sakura (cherry blossom) season, they naturally had a ‘Sakura’ set and that was what I was given for dinner. The total cost for it was 20,000 yen or $198~ (Php 9,200~) — a substantial price but I kid you not: it was all SO worth it. Yamanami is led by the distinguished Master Chef Juniichi Hirano and the restaurant’s interiors have a unique design that mixes elements from the west and the east. Their western counters presents a superb view of the city’s skyscrapers, while the eastern counter faces a Japanese style roof garden. He started to show me the fresh ingredients that he will be using… and when I laid my eyes on the beautifully marbled* pink slabs of Hida beef and Kobe beef, I instantly felt giddy and excited! *Marbled meat contains various amounts of fat, giving it an appearance that’s akin to a marble pattern. Marbling can be influenced by selective breeding and the type of feed that is being fed to the cattle. TRIVIA: Hida beef is a first-class (wagyu) Japanese beef brand raised in Gifu Prefecture that rivals Kobe beef, and has meat quality that is classified with the A/B rank and the 5/4/3 grade — this basically means that it’s damn good. *Hida beef, Kobe beef, and Matsuzaka beef are arguably the most famous beef types from Japan. But before that ‘fun’ starts, first: the appetizers. I was given a fruity soft cake and a dish of greens to start with. While I was gobbling that up, the chef started to cook the seafood (prawns and abalone) right before my very eyes and it was then that I realized how skillful he was as he maneuvered the food with his tools in precise and swift movements. He even made sure that a long metal tool was positioned before the food in order to avoid the oil from splattering over to my side. Additionally, I noticed that the iron griddle was spotless! They seem to absolutely ensure it remains in tip-top shape, which is so unlike other teppanyaki restaurants that I’ve seen on videos that typically have burnt surfaces! On to the grilled vegetables, I had some greens, mushrooms, beans, eggplant slices, and onions. These were paired with 2 sets of sauces and some salt. This, partnered with the seafood, were perfectly cooked — surely a wonderful prelude to the upcoming highlight of the whole teppanyaki set! I asked the chef to cook my steaks medium rare (don’t you ever order steaks ‘well done’! ), and I watched in anticipation as the slices of Hida beef and Kobe beef slowly turned from pink to brown on the outside, while still remaining its redness in the middle. When he started to cut them into cubes, I had to hold my breath as I saw how effortless it was for him to slice it all… it really looked sooooo soft and tasty! He proceeded to serve this on a plate that had crispy slices of garlic, pepper, and wasabi. I was told that I can eat the beef slices as is, but he also suggested that I try eating a cube with a slice of garlic on top or with a small dash of pepper. Of course, I took a bite first with no add-ons on it. I had a chunk of Hida beef followed by the Kobe one… and they. Were. Both. DIVINE!!! In fact, every kind of steak that I have tasted before (U.S. ribeyes, T-bones, tenderloins, etc. ), no matter how highly-graded they were, they simply have all suddenly paled in comparison! Yet of course, I wholly recognize the fact that taste is subjective. It’s even hard to say that Hida and Kobe beef topples everything else; but… I bet that once you get a taste of these, you’ll find that they might just very well be on top. After my first few bites, I paired it off with some garlic and pepper and the overall flavor was amplified even more! (NOTE: I hate wasabi; so I didn’t even try that, but I bet it would have tasted good too especially if you’re into its taste). By the way, before this teppanyaki affair, I was told by a dear friend of mine that these kinds of wagyu beef are decadent treats that are best taken in small quantities, which is basically why they are customarily served in small portions. Knowing that fact beforehand, I tried my best to chew slowly as I savored each and every bite. TRIVIA: Hida and Kobe beef both contain high levels of unsaturated fatty acids that melt at much lower temperatures than saturated fat. This is the reason why they dissolved on my tongue so fast! But that didn’t end there. Before I finished up my slices, the chef quickly cooked some garlic rice and served it to me with miso soup and pickles. Whilst I was basking in the afterglow, I was given a dessert plate which had apple pie paired with azuki (red bean) ice cream… At this point, I was a bit afraid of eating it because I still wanted to keep the lingering beef taste in my mouth. But then I gave in and I found it as a fitting ‘end’ to my whole teppanyaki meal; plus, it didn’t even take away the whole aftertaste! Meanwhile, you can also watch my video (vlog) below that showcases the whole of the experience in motion! Tasting Hida and Kobe beef for the first time at Yamami teppanyaki restaurant changed my life for the better… but also for the worse. Then again, I think that that’s the beauty of it! Because if I were to eat this regularly, the magic of it all will wane too soon and I wouldn’t want that. All in all, this was an experience that I will forever remember and an experience that I highly recommend that you should try especially when you’re in Japan! Eating these special kinds of beef is one thing, but experiencing it in a teppanyaki restaurant is a definite must-try — and I can definitely vouch for Yamami as your first. Clearly it’s not cheap… BUT this expense will be worth your every cent. Guaranteed! So start saving up now and treat yourself to this memorable mouth-watering affair! Reserve a seat at Yamami teppanyaki restaurant NOW! Many thanks to Keio Plaza Hotel for providing me with this complimentary teppanyaki meal experience! Still and as always, all views that are expressed here represent only those made by myself and NOT of any other entity in their favor. What do you think of teppanyaki? Would you like to try it? Why or why not? Or have you tried it before? How was it?